Would this gear shift lever fit our bikes? Re: Would this gear shift lever fit our bikes? IT FITS! Not only does it fit, it fits perfectly. 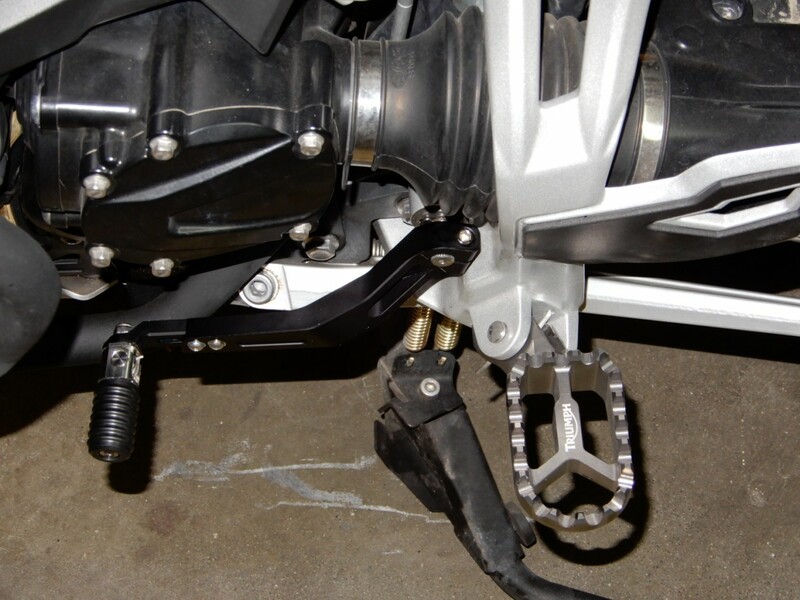 As stated in my original post, while wearing heavy boots I could not get my foot between the foot rest peg and the shifter peg because the distance between them was too short. This replacement lever is adjustable in length and solves that problem. 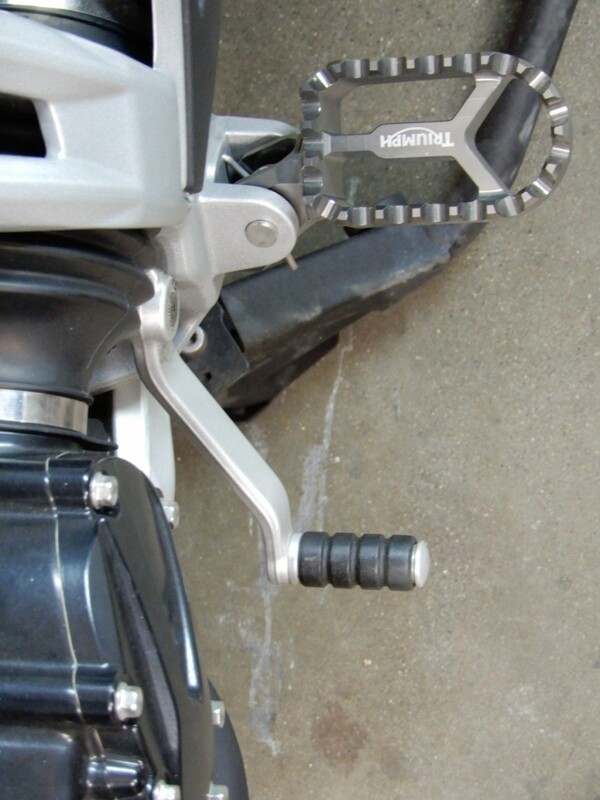 The toe peg is also folding, rather than ridged, so that if you drop your bike or hit an obstruction it might not break. Alternatives listed above are available, but the price point of those items seems a bit high (just a smidge). I never thought the factory lever was quite right for this bike. It almost looks like it was actually designed for some other bike entirely. This lever looks like the one Triumph should have used in the first place. 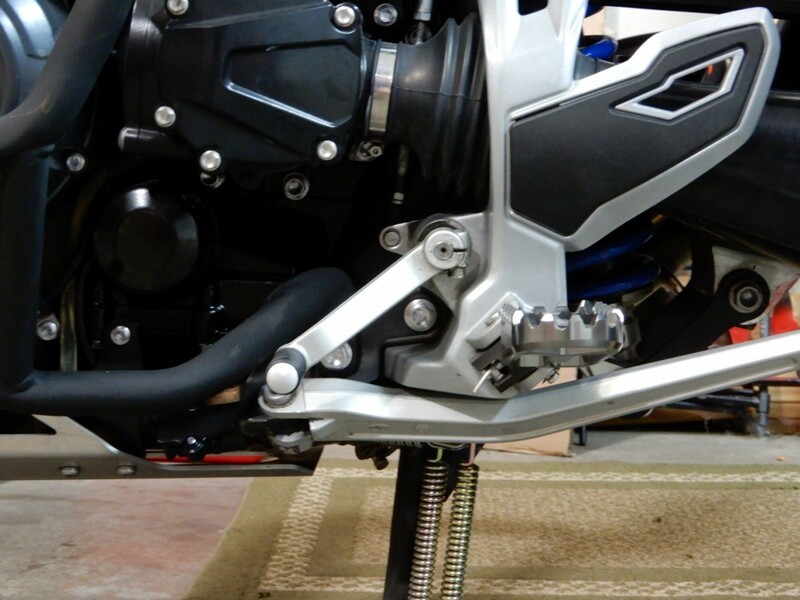 The contours fit along the lower engine assembly perfectly and nestle in well behind the engine guard. 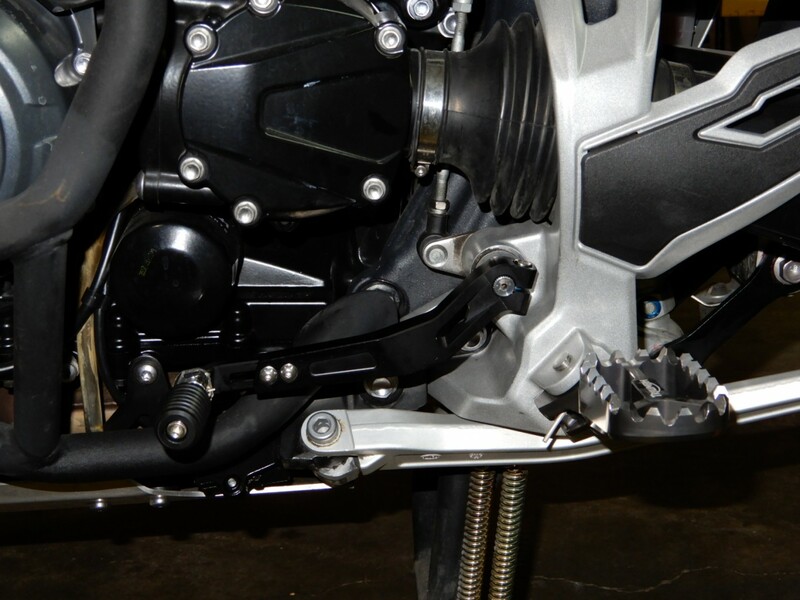 Even with the toe peg lever fully extended, it does not hit the engine guard with room to spare. 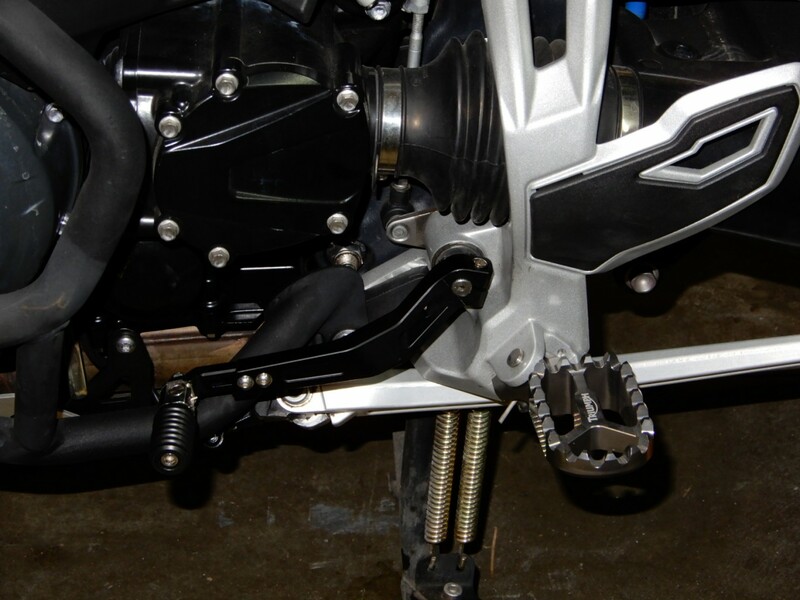 The shifter peg aligns better with the foot peg as well. I don't know how durable it is compared to the factory lever, so if someone would like to volunteer to buy one and smack it with a hammer feel free to do so. I will be carrying the factory lever in my little tool kit just in case I need it up in the mountains. So there ya have it, unless you have some kind of Sasquatch foot this should do you quite well. I will put two links below to sellers of this item. Both are on the China equivalent of Ebay website, but that's the only place I have found them. Sipping time to the US was 25 days. The spline fits tightly so lube it with Windex or similar window soap prior to installation (Windex dries and goes away completely in time). This product is made for BMW's so it comes with a wire thingy. As far as I can tell, BMW people run this wire from the forward tip of the shift lever to some point of their lower frame. I guess it's there as a brush / grass cutter, to keep sticks and grass out of the shift lever shaft area. Yea, I know, it's kind of a BMW mystery thing like putting zip ties on your wheel spokes. The design of our engine guards automatically pushes the grass outward so you should not need this wire part, but you can attach it to the rear skid plate screw if you are in a lederhosen kind of mood. I chose to skip it. Product links: (there are other sellers as well, but there is also one that looks very similar but has a different outward bend as seen from an overhead view). Looks good for us riders who are well endowed in the trotters! I don't know if that looks better than my SW Motech lever.......but I know my SW Motech lever doesn't look $150 better than that one! Very nice. Let us know how it works. 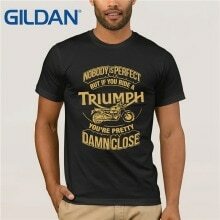 I like that T-Shirt! Do you hae a link to that one? Also, I forgot to mention that I did "Lock-Tight" the screws on that lever, they seemed like then would loosen up otherwise. The link for aliexpress works but it says it does not ship to the US! I just ordered the Touratech which fits my '15 TEx according to those who have it.